So, cards on the table time: I’m not really one for horror movies, and in fact even less so of slasher horror movies. My ability to suspend my disbelief long enough to care about the characters just doesn’t stretch that far, and as a result I am left very un-scared and very frustrated by the non-logical actions of the victims, to the point I’m almost rooting for the villains. There are exceptions to this rule, but these tend to be smart parodies such as the original Scream, or the more recent Cabin in the Woods. 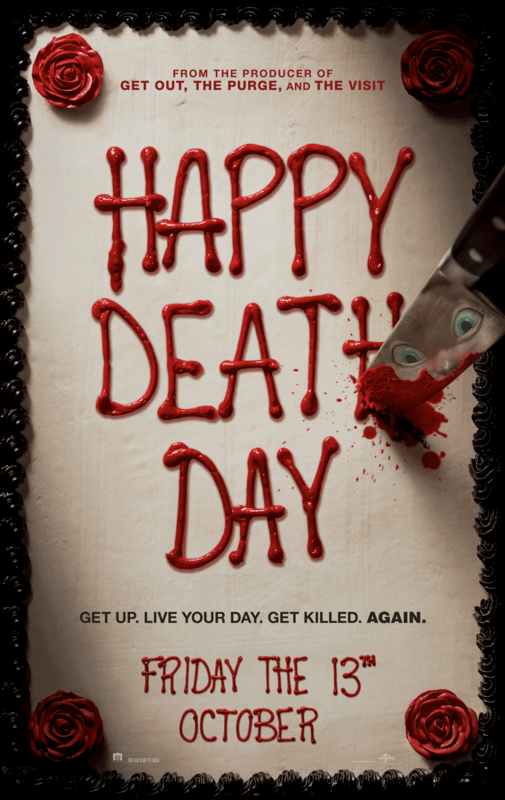 With this in mind I was willing to give Happy Death Day a go, as there seemed to be enough of an original concept to at least make this offering interesting. To sum up this new conceit for a slasher movie, we start in very traditional territory. Jessica Rothe (La La Land, Better Off Single) portrays our traditional victim, the beautiful, but shallow, Sorority girl Tree Gelbman, as she wakes up in an unfamiliar bed. It’s her birthday, and she makes her way through her day, underlining all the reasons why someone might want her dead, and low it comes to past she is killed. However, things take a turn to the Groundhog Day side when she wakes up again in that same unfamiliar bed, and the day starts to play out the same way again. We soon realise that she is destined to keep replaying this day until she figures out who the killer is, or she ends up irretrievably pushing up the daisies. So far so fresh, and luckily this movie continues in this vein, giving us a fresh, and character building, on the victim, letting us care about how she develops as a protagonist, and subverting all the traditional tropes of the victim. If there anything too stereotypical about the way the plot plays out, it is in the structure of the villain, or villains, leaving a bit of a frustrating feeling that maybe a trick was missed in where the screenplay could have taken us for a really fresh take on the slasher flick. That being said, the growth in Jessica’s character is really refreshing, and as a viewer we really do invest in where her character is going, even if the conceit of the movie takes a bit of the sting out of the tail of the plot. As for direction, Christopher Landon (Disturbia, Scouts Guide to the Zombie Apocalyse) makes sure it is crisp and concise, doing what is required to allow us to invest in the characters, and hope that everything works out ok. There is nothing groundbreaking here, but the flair on show does let us feel that the characters have a back-story, and a depth often missing in these type of films. Cinematography is also tight, allowing us to immerse ourselves in the world that Landon is painting on the screen, and that should be applauded at this level of the Hollywood machine. Are their problems? Well, yes. The “twist” is fairly obvious from the get-go, but a lot of the blame for that can be laid at the foot of the genre that Landon is working in here. We also have the issue that the rest of the cast, after we take Rothe out of the equation, are fairly paint by numbers. A lot of that can be excused by the structure of the film, with Tree having to relive the same day over and over, and in fact on a lot of levels, the reality that the cast have to stick so doggedly to their characters’ original attitudes and idiosyncrasies should be applauded, but you do feel that some growth should be factored in. Should you go and see his movie, especially at this spook-tacular time of year? Actually, personally I think you should. There is enough that is fresh and interesting here to make even the most jaded slasher fan sit up and take notice. The performances are at worst adequate, and at best charming, and the conceit itself adds interest into a very jaded genre. If I were you I would take a chance on this offering, and there is the prospect that you could find something fresh and exciting for this Halloween. a cast of relative newcomers hitting the mark. a genuinely fun concept for a slasher movie. some fun meta-playing with tropes. more that could have been asked of the extended cast. a predictable outcome and twist.